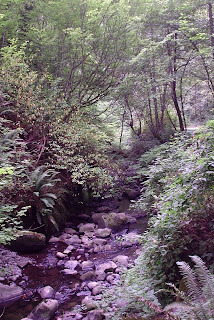 Well, to continue with my adventures this week, I hiked a couple of miles over at Cougar Mountain. 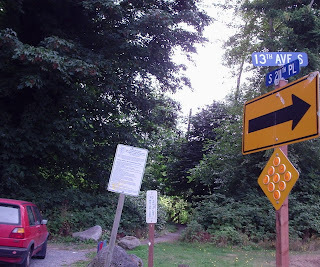 When I arrived at the trailhead, there was a notice about bear sitings. People had been seeing a momma bear and her 2 cubs almost everyday during the month of July along the Redtown and Quarry trails! Wow! I might get to see a bear. So at first I am hiking along quietly and looking every which way hoping to see a bear. But what if I surprise the momma bear and she gets angry? So, then I start talking to myself and singing little songs just to let the bear know that a human is walking here! Needless to say, I never saw a bear, don't know if a bear saw me. Not many of my photos turned out worth anything. It was kind of cloudy and underneath the canopy of the trees it was pretty dark. 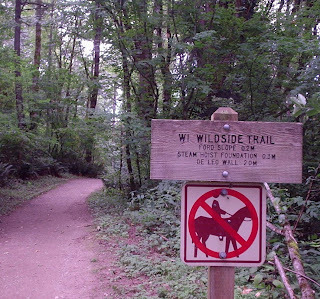 I was headed back to the trailhead along the Wildside Trail and I was taking a walk on the wildside this morning! The next day, I decided to head out to Farrel-McWhirter Park in Redmond, WA. It is mainly a horseback riding farm and park, but they have a couple of hiking trails around the place too. There were some cute new baby goats at the barn and the trails all had nice new signs since the last time I had hiked around here. Now today I was trying to get in a hike before I had to fly off for work and I always hike the Des Moines Creek Trail every year for hike-a-thon. It is convenient to the airport and it is a nice level paved trail. So I drive up and what do I see?? 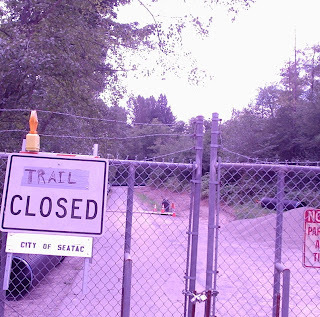 A Trail Closed Sign! Oh dear, what am I going to do now?? I happened to know that there are a couple more access points for this trail in the neighborhood and I thought I would go just check them out and see if they were closed off also. So when I drove around, there was nothing back there on the southern end of the trail telling me it was closed, so I hiked it anyway. I didn't get to do the entire trail because of the construction at the beginning, but I was able to get in one mile along pretty littl e Des Moines Creek. Hike-a-thon 2007 stats so far! Kudzu and Beer and Cornfields Oh My! Carless Hiking?? Not for me! Hike-a-thon is off to a rousing start!